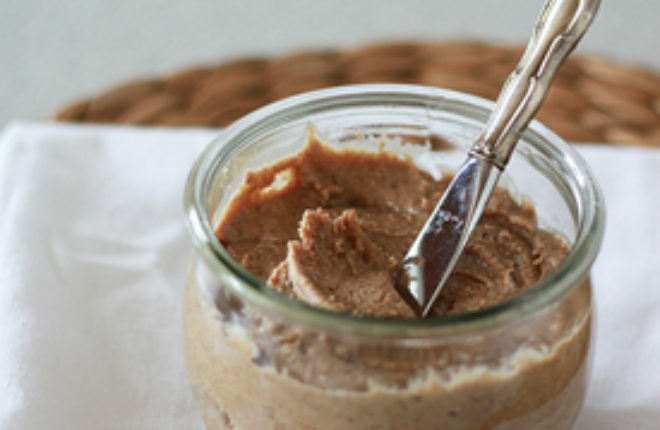 Making your own homemade almond butter is easy! 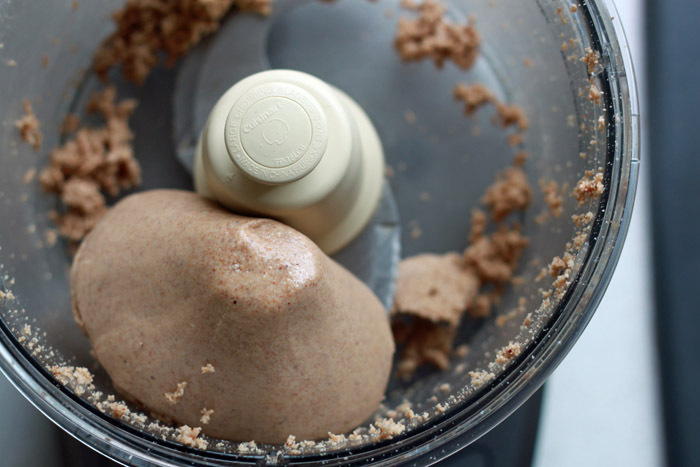 All it takes are raw almonds, a food processor or blender, and about 15 minutes of your time. It’s a pretty sure bet that just about anything I post here is something I’m currently obsessing over. 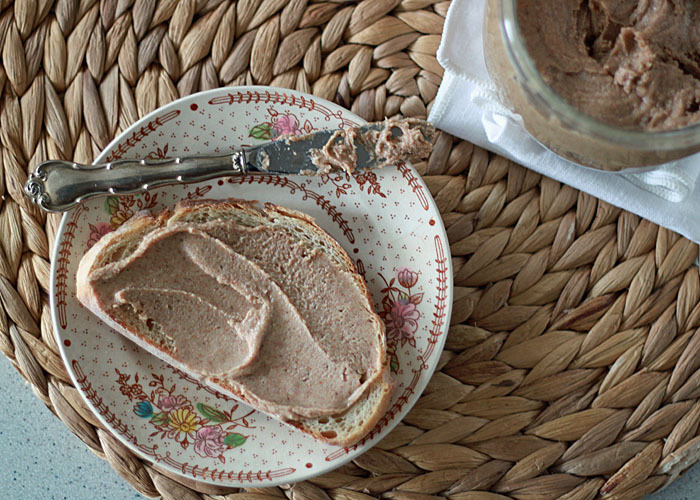 And almond butter is absolutely no exception. I am ob-sessed. I’ve also been making my own almond milk and almond coffee creamer. But almond butter, oh my lanta. So many flavors, so many possibilities. I’ve got a couple of variations (vanilla! espresso!) up my sleeve, but I thought I’d start at the very beginning. 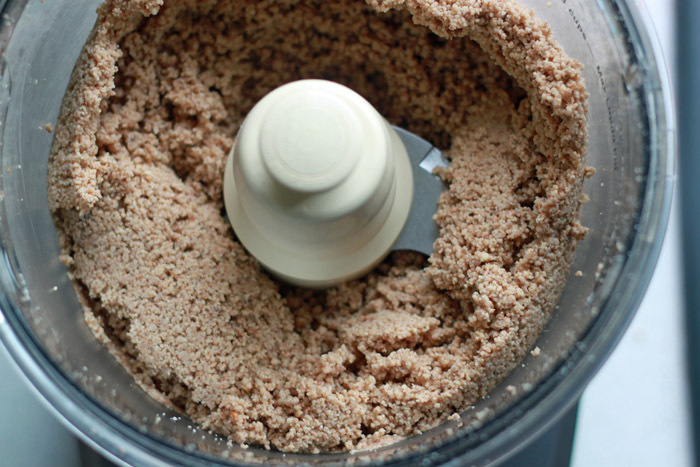 You need almonds and a food processor (or a high-powered blender). And a little salt, if you like. And that’s it! For this recipe, we start with one pound (about three cups) of raw almonds. This will yield just about two cups of almond butter. 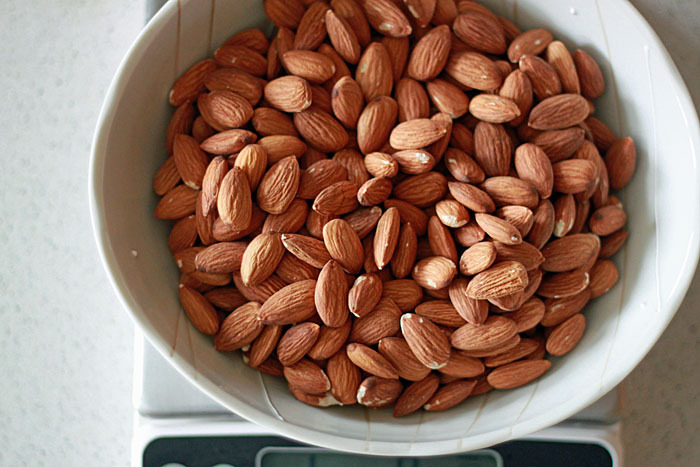 Place the almonds in a food processor or good quality, high-powered blender. I use a Cuisinart 14-cup food processor. Hit the “On” button and start pulverizing those suckers. From start to finish, this takes about 15 minutes. Crazy, but true! It takes awhile for the almonds to release their oils. Just be patient … it’ll happen. And 5 minutes. Just keep pureeing those suckers. 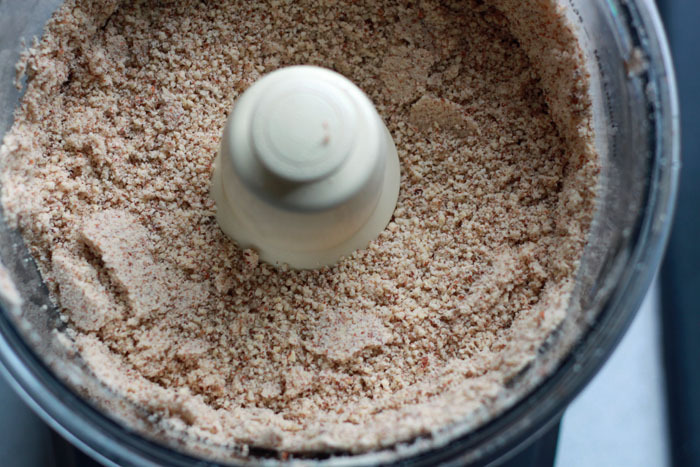 If the almonds start to climb up the sides of the food processor or blender, just switch it off, scrape down the sides, and turn it back on. 8 minutes. It’s starting to look like almond butter! Keep scraping the sides if necessary. At this point, the almonds will ball up and then even out again. 10 minutes. See the “balling up” I was talking about? Keep going! 12 minutes. We’re pretty much there! The almonds have released most of their oil and we’ve got a nice, buttery consistency. I keep going for a couple of minutes longer, though, just to make sure all of the oils have been released. And, finally, at 15 minutes. We’re done! We have almond butter! At this point, I usually add about 1/4 teaspoon of kosher salt for flavor, and pulse a couple more times. And then I stand over the food processor and inhale deeply and thank the food gods that we can take a big bunch of nuts, puree the dickens out of them, and come up with this incredible stuff. Spread on toast, make sandwiches, sauces, or do what I do most often: eat a straight-up spoonful for a snack. Oh, almond butter. I don’t ever, ever want to quit you. Place almonds in the bowl of the food processor or blender. Puree, scraping down the sides with a spatula as necessary, until almond butter forms. The almonds will first turn into a meal-like consistency, and then after about 10 minutes finally form a very thick almond butter. Keep going; the almonds will release their oils and transform into a delicious spreadable almond butter after about 12-15 minutes total time. Add salt toward the end of the process if desired. Keeps refrigerated in an airtight container for up to 2 weeks. 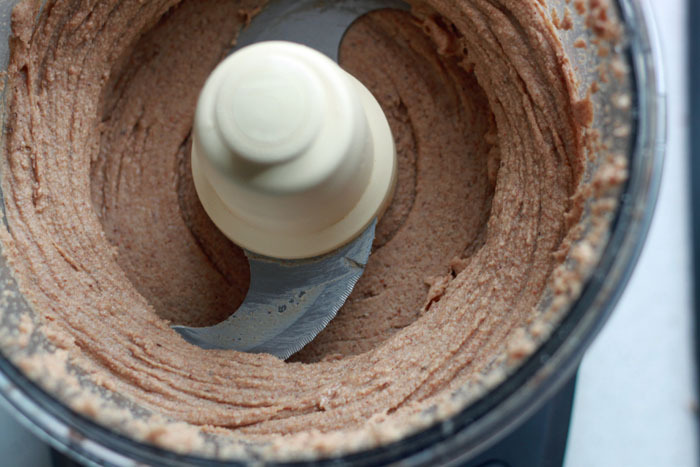 Note: keep an eye on your food processor or blender. If it shows signs of overheating, take a break for a few minutes before continuing. You know your equipment; err on the side of caution! I’ve been wanting to make my own almond butter forever! I’ve tried making it in my blender a couple times because I don’t have a food processor, but mine only gets to about the ten minute stage and then it firms up. Can you make with dry roasted almonds? Hi there, yes, you can! I’ve not done it myself, but I believe it might just take a few less minutes of processing to get to the almond butter stage. Thanks! That is easier than I had imagined! I just tried this and it turned out great and was ridiculously easy! Mine was done after about 12 minutes, probably because I only had about two cups of almonds. No reason to buy this anymore. I’ll just make my own! 12 minutes sounds just about right! For me, too, it really was pretty acceptable at 12 minutes but I just had to let it go a little longer just to make it a little thinner/smoother. Isn’t it awesome when you realize you can make something at home so easily and inexpensively?! Thanks, this will be very handy as we getting my toddler off diary for 3 weeks in a couple of days! Oh gosh, I feel for you. It would be so hard to have to eliminate a food group for our toddler – she likes so little as it is! Best of luck to you and hoping for the best possible outcome for you and your little one. There really are some incredible dairy-free recipes out there! Thanks, 2nd week without dairy products and going well, although she loves her cheese. 2 more weeks to go before the doctor appointment. I have by the way made the most delicious almond butter. The only thing I did differently from your recipe is to take pauses so the almonds (and food processor) would not get warm. I also added some water and mixed to clean up the bowl, and made delicious almond milk in the process! I’ll try with hazelnuts next time. I’ve been wanting to try my hand at almond butter for a while now. We started a grain-free diet and almonds are used a TON. I tried this tonight and my almonds never got past a grainy-dough like state. I have a heavy duty food processor (Cuisinart) and it still wouldn’t cream them into something more smooth. I added some coconut oil to try and help things get smoother but that didn’t work either. I used the non buttery almond “mash” in a muffin recipe anyway and it seems to have worked fine being in a recipe. Just can’t use it plain. OK- so the almonds were pre-soaked for the health benefits, did that have some sort of effect on them not getting creamy?? I would definitely NOT soak the almonds first. I do love the idea of using the almond “mash” in muffins though! For the gal who soaked her almonds first and than it didn’t work it is because the almonds still had moisture in them. If you are going to soak your almonds for health benefit which is how I make my almond butter make sure that you dry your almonds in a food dehydrator or oven before making the almond butter otherwise it will turn into a paste instead of a butter. Thanks for this awesome recipe. I have one quick question. 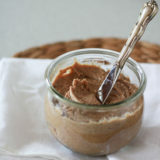 Is it safe to assume that 1lb of Raw Almonds will produce approximately 1lb of almond butter? Thanks again! Hi Kasey! I’ve never weighed before and after but I can’t imagine that the weight would vary much from solid form vs. almond butter form. 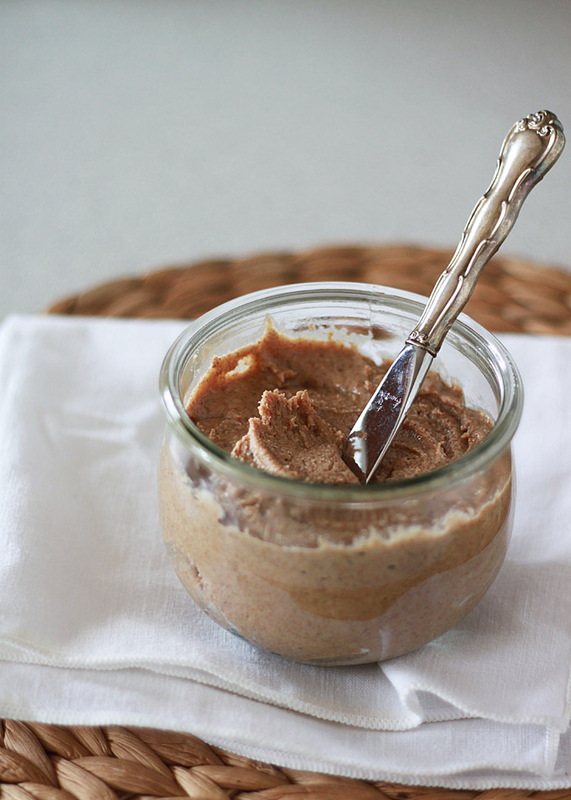 It might weight a little more in almond butter form if you add any ingredients of course! 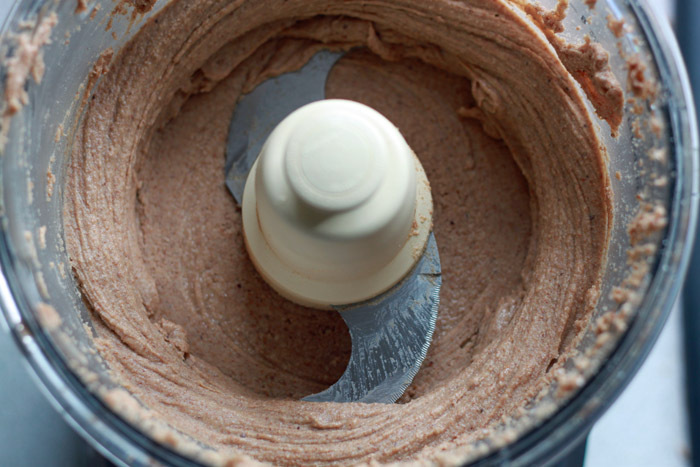 Loved the step by step of making the almond butter. Never made it before. I used 2/3 unsalted almonds and 1/3 salted roasted almonds. Sprinkled a little kosher salt when done. Had no idea of the process, so the photos helped. My homemade aond butter tastes much better than the stuff my hubby buys. I loved the step by step photos – From making powder to actually extracting the oils. Without your guide I wouldn’t have done it right. Thank you so much. The result was great. I just made this and I’m so grateful for the pictures. I think I would have given up after about 10 mins thinking it wasn’t working, but mine took about 15 mins and i was so glad for the pictures so i know when it was done! Thanks so much! I just used this recipe in a Ninja blender. It works fine. Thanks for the help. My friend, was buying a jar at the market and I asked her why did she not make her own. Now, I need to make my own. It looks so good. Maybe dry roasted would make it smell better? For some reason my batch was only about 1 cup. Is there a reason that it made so much less than yours? Do I have to blend it for longer? ive been making it for years. It only takes my cuisinart 5 minutes total from start to finish. I wonder why it takes so long in your machine? I’m not sure! I have a pretty high-power Cuisinart. Thanks for sharing, that may help some others that might be wondering why theirs took only half the time too. Hi! Thanks for the easy recipe! 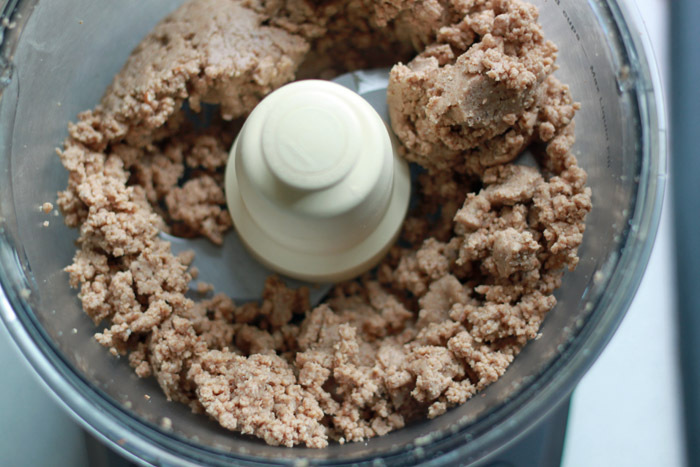 Can you make almond butter with the leftover almond pieces from making almond milk? Oh I wish, that would be perfect! Pretty sure that wouldn’t work – you need the whole almond. I am going to start experimenting with making almond milk. My husband and I have recently gone on a plant-based diet, but, I miss my yogurt. So, I’m going to try that first, but I do love almond butter, that’s next. My question is, there seems to be so much waste after making almond milk, is there anything you can do with that? Maybe dry it, add it to bread, etc? I”m just guessing, but would love some input!